I'm going to be honest. I fast forwarded through a lot of the Men Tell All last night. Like a good 60% because I was boredddduh. There were a few highlights so let's get to them. The men all wearing scarves at the beginning of the show let us know that they heard our out cries for less marves (man scarves) in the future. At least that's how I interpreted it. They focused a lot on Marquel and Chris so naturally my heart was full of love and light. I mean Marquel's cookie pin? Did you die, when Andrew called Marquel, Ron when addressing the racist comments? Because I literally floated out of my body from sheer horror and watched as Andrew put both feet in his mouth. 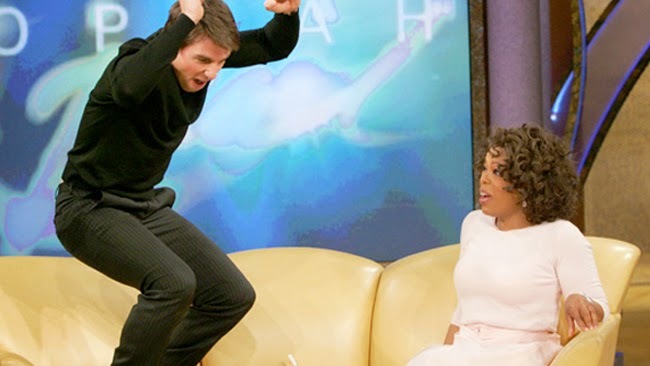 I went from Casper to Tom Cruise on Oprah when Chris got all intense and hot and awesome when he called out JJ for being a punk. 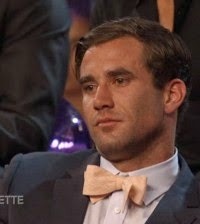 Also was it just me or was JJ's bow tie, clown sized? "Whatever Chris. Where did you buy those pants? The toilet....store?" Marquel talked about how he was super great at friendzoning himself with women, which I find terribly hard to believe. Yet I totally understand because I pay a pretty hefty mortgage on my home located in the neighborhood of Friendzonia. He then threw cookies into the crowd which I would have knocked women on the floor for. I would have liked it a little more if he shot them out of a t-shirt cannon, but to be honest with everyone here, I just really like anything shot out of a t-shirt cannon. I should probably invest in one. I fast forwarded through everything that Marcus said, and through the awkward ultrasound. I also fast forwarded through the majority of that broad who wanted to date Chris. The caption clearly states "Chris Soules & RANDOM girl..."
1. Don't sit so close to him. 2. You're from Canada, he lives in Iowa. It will never work. Ketch-yourself talking to Chris again and I'm going to pull your hair and pinch the back of your arms. That last one might be too long to put on a name change request form, but it's worth a shot. Andi came out and talked to the men. It was a general snooze fest as per usual. 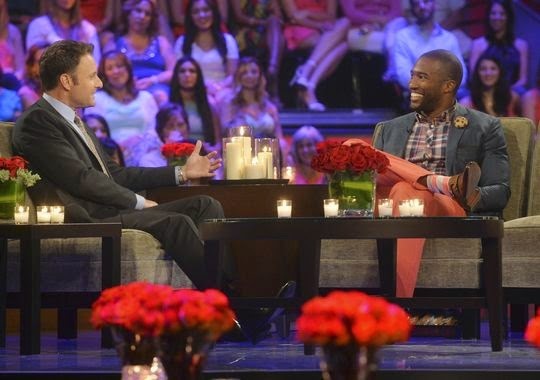 Chris Harrison spiced things up when he read some of the results from the lie detector test. Coach, Chris, and JJ were all 100% truthful, while Josh, Dylan, and Marcus lied. We learned that Marcus has slept with more than 20 women. Dylan liked blondes better and wasn't ready to get married. Josh had two lies, but since he wasn't there to defend himself she decided not to read it. Did anyone see the easter egg at the end of the show, where Chris delivered a note to Andi from one of her top two? It was on loose leaf notebook paper so clearly they didn't pull out the big stationary for the occasion. Or it's all a trap, and it's a ransom note from Marcus. I'm attached enough to the final two to really care who she picks but I'm interested to see if that actually means anything next week. They also showed us an extended preview of "Bachelor in Paradise,"
and I am so in. I never watched "Bachelor Pad," because money was involved and I felt like that was cheap. I'm in to for the right reasons folks. So I'll be doing recaps of that too if you interested. What do you think was in that letter? 1. Can we give an honorable mention to Dylan's new haircut - sexxxxxxxay!!!! That ponytail had to go! 2. Chris4Bachelor. Crazy Ketcha better not be a contestant though. Yuck. 3. We CAN'T WAIT for Bachelor in Paradise. Can't wait to read your recaps! Can't wait to read your recaps of BIP! I thought you would make a funny comment about the clear bromance between Dylan and Brian. There were some gems from those two. Yeah for the final next week. Can't wait to see how the drama unfolds. The best part was the BIP preview. I am SO excited for that to start, and I am so sick of Andi... And I was so excited for her to be Bachelorette. Disappointing! I haven't popped over here in a few weeks, so I was super-psyched that there were so many new posts. I was going to ration them because I need your blog on a daily basis, but then I read all the posts in one sitting. Write on. Your fans need you. I'm also from canada, but you are the best. I watch the show so I can laugh more deeply at your recaps. Now I guess I'll have to watch BIP too..